Ask any business owner if they’d like tens of thousands of potential customers who ‘love’ their business. People ready and eager to buy from them. I’m sure every one of them would say yes. In a kind of restaurant owner utopia, that’s exactly what Paul Stenson accidentally experienced for the White Moose Cafe. Up until 12th August 2015 the Cafe was just like any other restaurant, when an awkward customer started a chain of events that propelled the cafe into the limelight. The customer’s complaint kick-started an intensive 8-week flurry of social media activity. Going truly ‘viral’ the restaurant (located in Dublin, Ireland) reached countries as far as New Zealand, Australia, USA and Germany. They even made the front pages of Reddit, Imgur and Yahoo. The restaurant’s Facebook page grew a fan base in the tens of thousands and received over 15,000 five star reviews. Although the initial ‘buzz’ has died down, Paulie and his team are still reaping the rewards. Some fans are even pledging to travel huge distances to visit the cafe. You’d think some kind of celebrity news had occurred, or something ‘amazing’ had been discovered. Nothing could be further from the truth. It all started because a vegan wasn’t happy with the limited choice of options available on the menu. While this situation was far from contrived, it’s very possible to employ similar tactics for your business. We do this for some of our clients and enjoy wildly successful results. 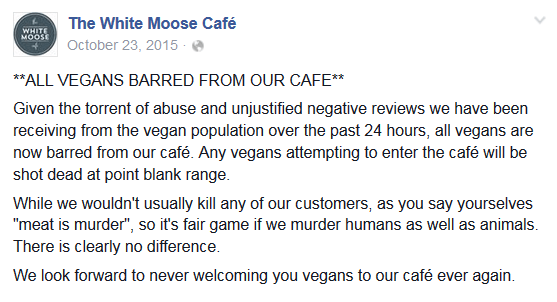 Vegan customer visits White Moose Cafe. Customer not happy with lack of vegan options and complains to staff. The next few weeks passed without incident. 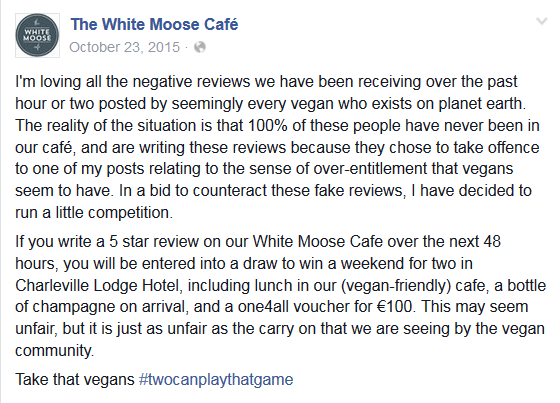 White Moose starts getting hundreds of 1* negative reviews. The instigator is a young, vegan girl called ‘Tee Jay’. She mistakenly took ‘idiosyncratic’ to mean ‘idiotic’. Feeling offended she posted on vegan chat forums. 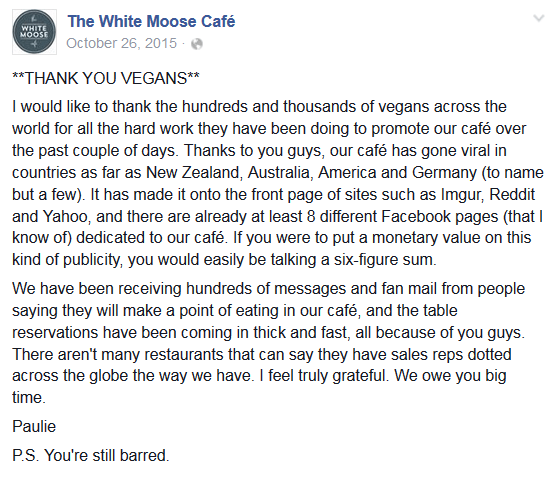 An avalanche of abuse from vegans the world over ensued and the White Moose Cafe received over 2000 negative 1* reviews in just a couple of hours. What a set of chance circumstances. It must have been hell of a roller-coaster ride for Paulie. Imagine a harmless, 6-week old Facebook post inciting a few thousand people to come and start ‘bad-mouthing’ your business. Getting 2000 1* reviews in just a couple of hours. Paulie had no way of knowing that bigger numbers of ‘meat-eaters’ would come to his rescue and post tens of thousands of 5* reviews, effectively counteracting the poor ones. If he hadn’t kept his cool, and more importantly his sense of humour, he might never have inspired those ‘meat-eaters’ to his defence. Definitely a big social media lesson there. Visit the Facebook page and you’ll see Paulie’s cocky manner, cavalier approach to authority and disregard for ‘the rules’. His posts are littered with the worst of swear words. It certainly won’t appeal to everyone. But that’s the point. This polarisation is what gives him such appealing personality. He is ‘loved’ by some (his newly found target audience) and ‘disliked’, or ‘hated’, by others. Business owners take heed. Many of us make the mistake of trying to appeal to everyone who could possibly buy from us. We’re scared of upsetting anyone. Ironically, this makes our businesses less appealing. I think there are 2 main ways you can interpret the lessons of the White Moose Cafe and then employ those lessons to contrive results for your business. The first is to create controversy with 2 sides. 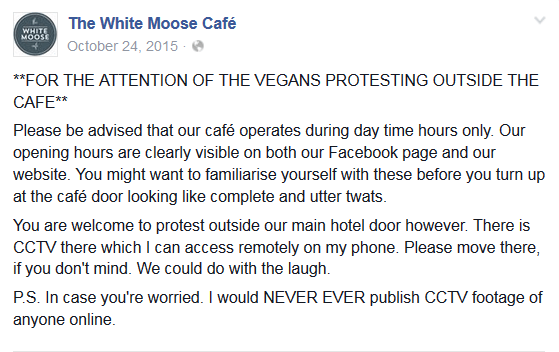 This can be 2 opposing groups of people, like in the White Moose Cafe example above. Or it can be a controversial issue between passionate members of the same group. Think of a sports team. There are many passionate deliberations between fans about which players should be playing in a particular position. But when the team has an opponent, the fans are united as one. Throw in some poor refereeing decisions and passion and controversy combine to really ignite. Can you polarise or specialise? At Marketing Together we only provide services to small businesses in Australia with less than $10 million TO (the majority are between 250k – 6 million). They must be either high-ticket item businesses or have naturally repeating customers. High ticket examples include Property, Pest Control, Kitchen/Bathroom Sales, Finance and Builders. Repeating businesses include Restaurants, Salons, Fitness Centres and Dentists. We don’t focus on acquiring plumbers, electricians, emergency locksmiths as clients, as they don’t suit the style of marketing we like to employ. The second is to ask your audience to choose a point of view. This needn’t be extreme. A clothing store can put 2 pictures of different dresses side-by-side and ask their audience which they prefer. An Italian restaurant can run a poll on Pizza & Beer VS Pasta & Wine. It helps to limit choices to just 2 options. We offer just 2 main choices at Marketing Together. Outsource your marketing department to us or use us for marketing consultancy. The only other option is not to use us at all.